Integration of graphene derivatives into plastic- and paper-based substrates as a biosensing platform. 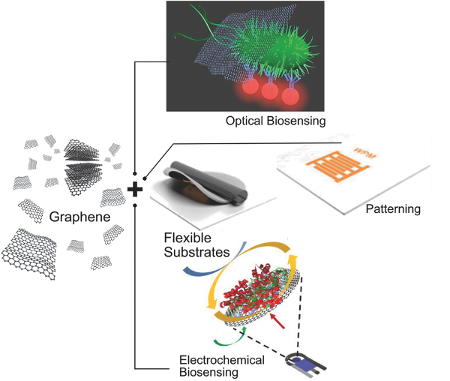 We envision a new generation of biosensing devices based on the synergy between flexible, lightweight, easy-to-use, versatile, and cost-effective materials (paper and plastic) and the outstanding properties of graphene derivatives. A biosensor is an instrument that measures a characteristic property of an analyte with a detector located on a substrate. The ICN2 Nanobioelectronics and Biosensors Group, headed by ICREA Professor Arben Merkoçi, discusses in an Advanced Materials invited essay about graphene-based optical and electrical biosensing platforms with the integration of graphene derivatives (as detectors) and plastic and paper (as substrates) in order to simplify and improve the biosensing technology. Biosensing has become an important approach within technologies facilitating diagnostics, drug discovery, food safety, defence, security and environmental monitoring. These technologies integrate highly desirable characteristics such as specificity (suitably identifying the target analyte), high sensitivity (determining low levels of the analyte), fast results (within a couple of minutes), extended shelf life and easy-to-operate capabilities. However, when it comes to cost-efficient devices these features are often conflicting. Interestingly, nanomaterials offer new opportunities to overcome this challenge. Specifically, graphene derivatives (pristine graphene, polycrystalline graphene, graphene oxide…) are two-dimensional nanoscale materials used as a basis of biosensors due to their excellent properties facilitating unique biosensing approaches. The ICN2 Nanobioelectronics and Biosensors Group develops in the essay the idea that flexible, abundant, low-cost and green substrates (plastic and paper) can enhance the graphene-based biosensing field. Using the ICN2 patterning procedure, for instance, researchers from this Group are able to create a graphene-based biosensor with any desired shape and dimensions. In the invited essay, two types of biosensing platforms are exemplified by the ICN2 researchers. First, electric sensors made of graphene derivatives on paper and plastic substrates that measure an electric parameter (current, voltage, resistance…), which changes during specific interactions. This variation is related with the analyte concentration that wants to be measured. Second, optical sensors; its modus operandi is the same as electric ones. The only difference is on the measured parameters, which are optic, such as absorbance, fluorescence or photoluminescence. Precisely, in an Analytical Chemistry study, ICN2 (in collaboration with other institutions) reports a paper-based biosensor for pathogen detection using the photoluminescence quenching ability of graphene oxide. When graphene derivatives are combined with cheap, lightweight and flexible substrates (such as plastic and paper), interesting opportunities arise. However, overall commercialization of graphene-based biosensors will imply overcoming diverse technical, production, and market issues. The authors think that getting their best opportunities in applications not dominated by conventional materials, simple graphene-based biosensors will lead to breakthrough solutions for the real world. Morales-Narváez, E., Baptista-Pires, L., Zamora-Gálvez, A. and Merkoçi, A. Graphene-Based Biosensors: Going Simple. Advanced Matter, 2016. Doi:10.1002/adma.201604905. Eden Morales-Narváez, Tina Naghdi, Erhan Zor and Arben Merkoçi. Photoluminescent Lateral-Flow Immunoassay Revealed by Graphene Oxide: Highly Sensitive Paper-Based Pathogen Detection. Analytical Chemistry, 2015. 87 (16), Pages 8573-8577. Image reprinted with permission. Patterning image: Copyright 2016, American Chemical Society. Electrochemcial biosensing image: Copyright 2016, Elsevier; Optical biosensing image: Copyright 2013, Wiley-VCH.